A perfect pair of jeans deserves the right kind of attention. We partnered with Electrolux appliances to make sure you never have to worry about ruining your favorite denim again. No wardrobe is complete without a solid collection of jeans. Since we know that caring for denim can be tricky, we're here to help. The first rule of thumb: you don't have to wash them often, but when you do, there's a right way. From white to distressed to skinny, ahead are tips that will help make sure you get the longest life out of your go-to pairs. To prevent the waistband of your jeans from stretching, button and zip them before putting them in the washing machine. If your jeans are a bit too tight and you actually want them to expand a bit, let them air dry after washing and pull on the damp band while going over it with a steam iron or hair dryer. 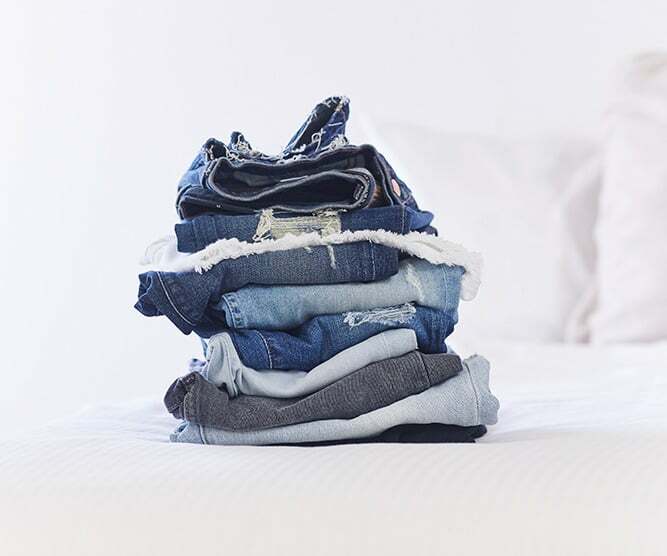 When storing your jeans, don't stack folded pairs too tightly together — they need room to breathe! The less frequently jeans touch water, the longer their color will last. When washing your denim, flip them inside out and use cold water with a mild detergent. Let them air dry, but if they get a little stiff you can put them in the dryer on very low heat for a few minutes. Even for white denim, it's best to follow the same regimen, but you can use hot water to get rid of stains. You can keep your jeans fresh by adding baking soda to your washing machine, but in between washes, get rid of any odors by hanging your jeans in the bathroom while you take a shower. The steam will freshen them up without jeopardizing shape and color. For the experimenters out there, freezing them in a plastic bag for two days is also known to do the trick. Want to know the secret behind great style? The new Electrolux Washer with Exclusive Smartboost Technology is an effective stain remover that keeps your whites white and your bright clothes bright! Click above to watch the video now!